Binoculars are, in simple terms, optical instruments consisting of two small telescopes mounted side by side, one for each eye, and a focusing mechanism. Binoculars are typically designed to magnify the image of an object 6 to 12 times. 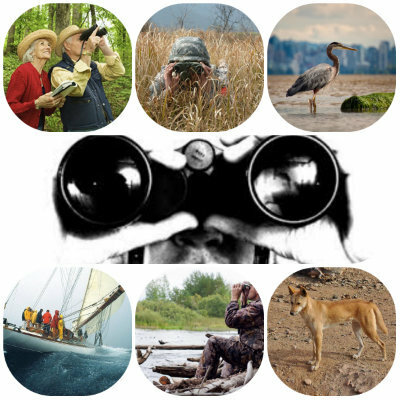 Binoculars are rated both by the magnification they produce and the diameter (in millimeters) of the objective lens. Thus 6 x 30 binoculars magnify 6 times and have objective lenses 30 millimeters in diameter. The larger the objective lens, the greater its ability to gather light. Many binoculars have range finding reticule (scale) superimposed upon the view. This scale allows the distance to the object to be estimated if the object's height is known (or estimable). The common mariner 7×50 binoculars have these scales with the angle between marks equal to 5 mil. Also available with compass.